Had a Declaration of Independency been made seven Months ago, it would have been attended with many great and glorious Effects . . . . We might before this Hour, have formed Alliances with foreign States. — We should have mastered Quebec and been in Possession of Canada …. 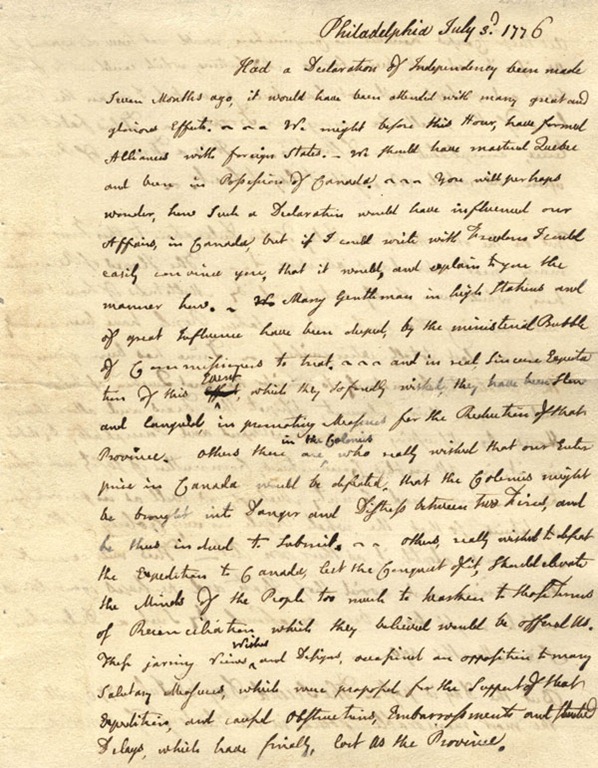 You will perhaps wonder, how such a Declaration would have influenced our Affairs, in Canada, but if I could write with Freedom I could easily convince you, that it would, and explain to you the manner how. — Many Gentlemen in high Stations and of great Influence have been duped, by the ministerial Bubble of Commissioners to treat …. And in real, sincere Expectation of this effort Event, which they so fondly wished, they have been slow and languid, in promoting Measures for the Reduction of that Province. Others there are in the Colonies who really wished that our Enterprise in Canada would be defeated, that the Colonies might be brought into Danger and Distress between two Fires, and be thus induced to submit. Others really wished to defeat the Expedition to Canada, lest the Conquest of it, should elevate the Minds of the People too much to hearken to those Terms of Reconciliation which they believed would be offered Us. These jarring Views, Wishes and Designs, occasioned an opposition to many salutary Measures, which were proposed for the Support of that Expedition, and caused Obstructions, Embarrassments and studied Delays, which have finally, lost Us the Province. All these Causes however in Conjunction would not have disappointed Us, if it had not been for a Misfortune, which could not be foreseen, and perhaps could not have been prevented, I mean the Prevalence of the small Pox among our Troops …. This fatal Pestilence compleated our Destruction. — It is a Frown of Providence upon Us, which We ought to lay to heart. Thanks for posting this. And how about the fact that both Thomas Jefferson and John Adams died within hours of each other on the 50th anniversary of the 4th of July in 1826? Even though he had no way of knowing that Jefferson died a few hours before, Adams said, “Jefferson lives.” Or was it, “Thomas Jefferson survives”? Nope, I had no idea. I just did a quick Google check, and it seems our 5th president, James Monroe, the last of the Founders who became president, died on July 4th, 1831, five years after Adams and Jefferson. Thanks for posting this. Two of my favorite books are John Adams by McCullough and Founding Mothers by Cokie Roberts, both of whom used the extensive correspondence between John and Abigail. It is nice though to see the letter and read it entirely and in context. Thanks. Russ, thanks for that additional note — I did know that. 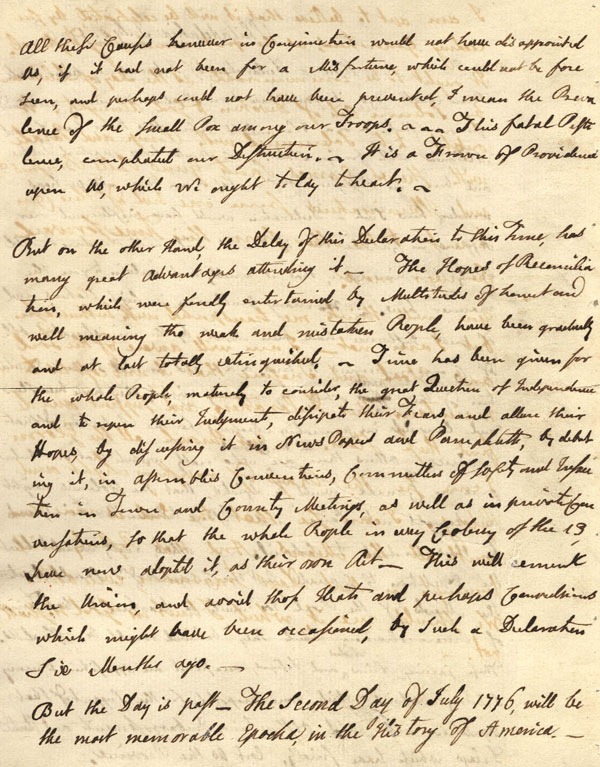 Susan, I find the entire correspondence of the letters between John and Abigail very moving. It is available online, in a volume published by Harvard entitled My Dearest Friend, and in a convenient Penguin paperback, The Letters of John and Abigail Adams. 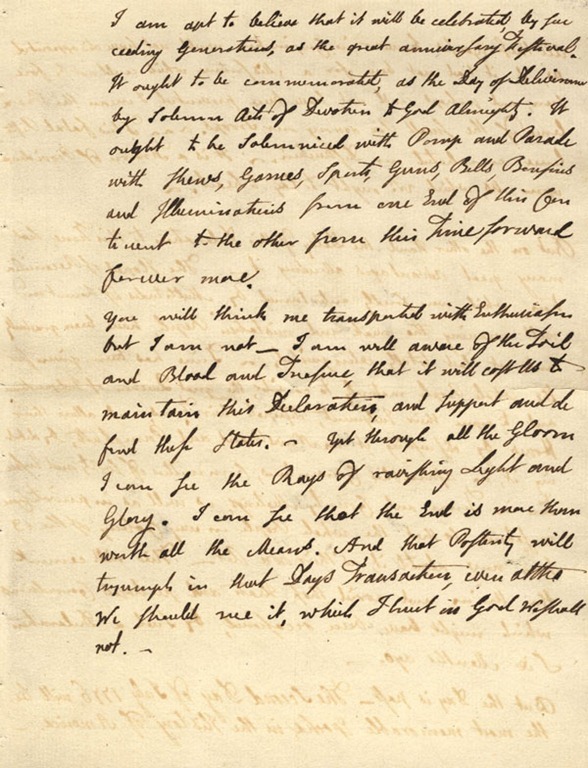 Have you read the letters that went back and forth between Adams and Jefferson? My daughter bought me a copy for my birthday. Great, great reading.